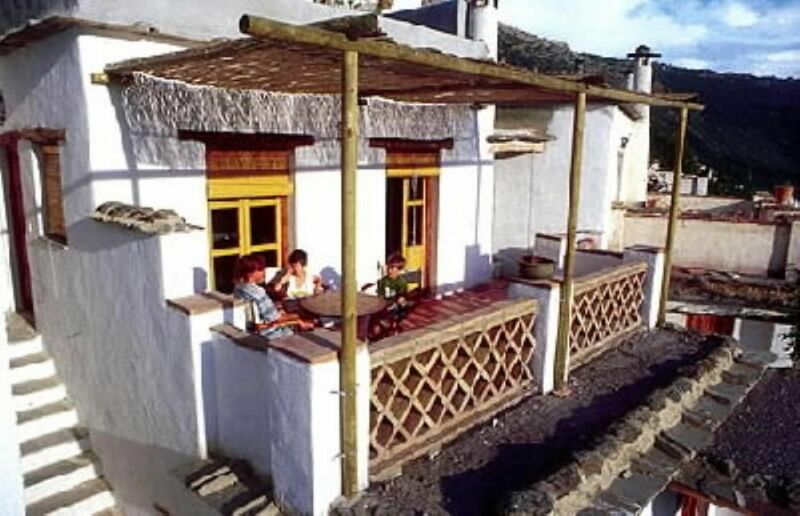 From the terrace you can enjoy the beauty of the Poqueira Valley and the white washed Moorish villages. It is the perfect place to learn to know the Sierra Nevada, with the highest peaks of Spain (Mulhacen 3482m and Veleta 3392m)See the video on our website! We had a lovely time in Bubion - Janny was very welcoming and very helpful when we lost our camera an hour's drive away! Janny met us on the first day to settle us in, and was also kind enough to let us use the pool she shares with her neighbours (just a short walk up the road) to allow the children to cool down during the hot days. The view from the property is stunning, and it was lovely to eat out on the terrace. We had some great days out with the kids - at the waterfall above Capileira, the magnificent public swimming pool in Mecina Bombaron (an hour away) with views back over the village, beautiful swimming at the hotel pool in Mecina Fondales (15 mins drive), river swimming with the local children at Trevelez just under the bridge going out of town (freezing but so clean! ), pootling round the lovely villages of Bubion, Capileira (fabulous grassy garden for a quiet drink or a reasonable meal at Paco Lopez), Pitres (great village square, and walkable down to Mecina Fondales). Try the great pizza for lunch at the pizza restaurant on the "main" road in Mecina Fondales. Also enjoyed a day out in Granada, only an hour away. We had a brilliant stay and would definitely recommend the area. We enjoyed the stay of these clients very much. They were very respectful and the girls really very intelligent and well educated. We look forward to receive them again any time they like. We stayed in this apartment for 12 days and loved it. It is spacious and very nicely furnished, with a very large sunny deck. The central heating was excellent and there was wood for the fireplace also. The apartment is well equipped for cooking and there is a supermarket 2 minutes walk away. The apartment is very quiet, but close to everything in Bubion. The owners Janny and Manuel are so nice, really friendly and interesting, and nothing is too much trouble. We would love to come back again. You both were also excellent guests! Thanks and looking forward to see you again. Apartamento muy tranquilo y con unas magníficas vistas. Bubión tiene la ventaja de ser más tranquilo y menos turístico que Campaneira y Capileira pero se encuentra situado a sólo 5 minutos de ambas poblaciones. Hay multitud de senderos de dificultad media, todos muy diferentes y bellos. Estuvimos con nuestros 2 hijos perfectamente. Lo recomendamos para pasar unas vacaciones relajantes! Gracias Jolanda y Manuel por vuestro comentario, esperamos volver a recibiros otra vez cuando querais y muchos saludos a vosotros y vuestros hijos. Sehr gemütliches Domizil mit herrlicher Aussicht. Im Haus ist alles was man braucht. Sehr nette auch deutsch sprechende Vermieter. Direkt im Dorf gute Einkaufsmöglichkeiten und Restaurants. Wunderbarer Ausgangspunkt für herrliche Wanderungen. Auch das Meer ist mit dem Auto gut zu erreichen. Vielen Dank Tilo für Ihre positive Kommentare. Wir hoffen Sie wieder begrüssen zu dürfen in dieser schöne Ecke von Andalusien! "Maison très bien située, dans un village charmant, site dépaysant. Idéal pour randonner. Propriétaires d''une grande gentillesse." "petite maison adorable.nous avons passé un sejour délicieux. accueil très chaleureux.Il y a tout ce qu''il faut pour cuisiner.merci pour tout.isabelle"
When the weather permits there are buses going into the national park untill 2700 m.
Granada is 70 km, the Meditteranean Sea 45 km. When you want to visit the Alhambra it is wise to make your reservations in advance. En caso de puentes o estancias de fines de semana se pide el pago de una noche por adelantado y el resto a la entrega de llaves.